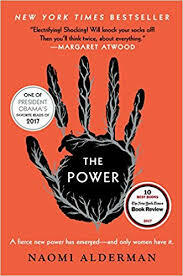 I read The Power on holiday last week. I'd heard a lot about it because it won a bunch of prizes last year, but I wouldn't necessarily have picked it up by myself. But it was chosen for my book club as October's book so I thought I'd take it on holiday. I actually owned a copy of the book, which I'd received in a subscription box last year, so that was good as it meant I didn't need to buy it! Anyway, it's basically a science fiction novel. It looks at a time when women awoke the power that was within them, a power to emit electricity from their hands which can inflict pain. It started in teenagers, but they could awaken it in older women. Soon, boys were being segregated in schools for their own safety and girls were being used in war. The book follows four stories. There's Allie, a kid who has been in and out of the foster system and who is being abused by her adoptive father. She escapes and reinvents herself as a religious prophet. I liked Allie a lot; I think her motives were pure and I liked where she ended up. It would be interesting to read a whole book just from her perspective I think. There's Roxy, the illegitimate daughter of a London gangster, who is extremely powerful and who uses her power chaotically, which I really liked. I liked Roxy's storyline and found it the most heartbreaking. There's Tunde, a man who sees the power just as it is awakening and who then travels all across the world as a journalist, trying to get the next scoop before anyone else can. I didn't like Tunde as a person, I sort of thought he deserved a lot of what happened to him, but I did like the storyline, and I thought it said a lot about the modern world and people who are greedy for the next big story. And finally there's Margot, who is mayor of a city but who wishes to be governor of the state and who uses the power and everything she can gather to get ahead in her game. I didn't like Margot but I understood her ambition. I also liked the subplots with her daughter Jocelyn, which I won't spoil but which raised a lot of questions around gender in the book. I'm not sorry I read this, but it isn't a favourite. I'm giving it seven out of ten, and one of those points is for the concept alone. While this isn't a book for teenagers, it is definitely a concept that may appeal, and I think an older, discerning teen could certainly understand and enjoy the book. There's a lot of violence, in parts quite graphic, and some sexual violence too, which is also graphic. I'd say take care of yourself, but as someone who read the Handmaid's Tale at sixteen, I think this is on the same lines, so read it if it appeals!